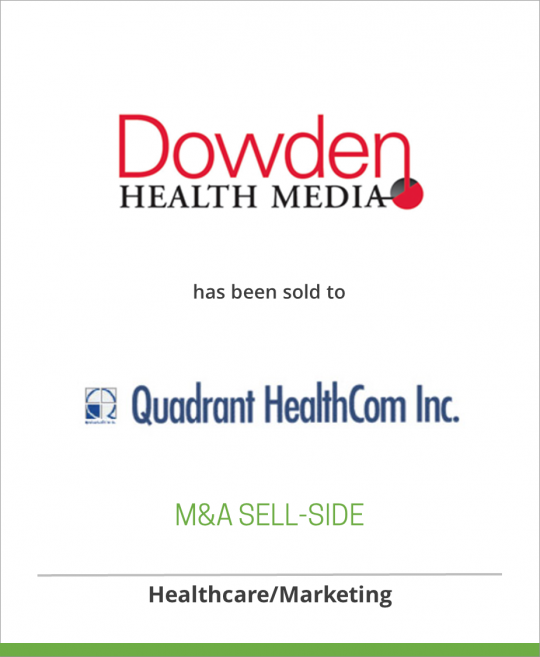 Lebhar-Friedman Inc has sold Dowden Professional Publications to Quadrant HealthCom Inc.
Lebhar-Friedman, Inc. announces the sale of Dowden Professional Publications, the Dowden medical journals publishing division, to Quadrant HealthCom Inc. Included in the sale are OBG Management, Current Psychiatry, Journal of Family Practice and Mayo Clinical Proceedings. DeSilva+Phillips acted as financial advisor to Lebhar-Friedman in this transaction. Lebhar-Friedman, Inc. has leveraged an 80-plus year history of publishing excellence and is among the country’s leading B2B and healthcare media companies. Headquartered in New York City, with leading B2B titles such as Nation’s Restaurant News, Drug Store News and Chain Store Age, Lebhar-Friedman’s business units are dedicated to providing executives, professionals and clients with timely and relevant information online and in print. Based in Montvale, New Jersey, the Dowden Health Media unit includes Medical DecisionPoint/Convergent, a full-service medical communications agency, and Dowden Custom Media, a specialized business delivering online and offline content that is customized for hospitals, healthcare organizations and other healthcare-focused businesses. Quadrant HealthCom Inc. publishes ten medical journals reaching 400,000 prescribers every month in the primary care, neurology, psychiatry, urgent care, emergency medicine, women’s health, pulmonary, dermatology, orthopedics, nurse practitioner/physician assistant and federal markets. The company also develops specialized communications projects, including interactive multimedia, meetings development and management services, custom-sponsored programs, and special journal editions. Quadrant is based in Parsippany, New Jersey. Sold to Quadrant HealthCom Inc.